by Dr. Barbara Reimensnyder Duncan, edited by Government & Heritage Library Staff. Reprinted with permission from The Tar Heel Junior Historian, Fall 2009. A powerful cry echoes from the mountains: “Whoooooo hooo!” A group of Cherokee men answers even louder: “Whoooooo hooo!” The cry from the mountains echoes back. Seven men walk out, covered in red paint from head to toe, wearing only breechclouts fastened around their waists and moccasins on their feet. They walk quietly but with a sense of power. They continue to call, while the mountains echo—like voices from the past and present. It could be the year AD 1000, with the Cherokee preparing to go to war with the Creek or Seneca tribe? It could be the year AD 1762, when Lieutenant Henry Timberlake visited the Cherokee capital of Chota and described this dance in his later writings? No, it’s 2009. The Warriors of AniKituhwa group is dancing for students from Cherokee Elementary School at their field day at the Kituhwa Mound. The Eastern Band of Cherokee Indians bought back the Kituhwa Mound in 1997 because tribal tradition holds that this was the place of the first Cherokee village, thousands of years ago. A sacred fire burned for centuries at the grass-covered mound—a burial site—along the Tuckasegee River near modern-day Bryson City. The Cherokee named themselves Ani-Kituhwa-gi, or the people of Kituhwa. The modern Warriors of AniKituhwa are performing a traditional Cherokee dance that was almost lost. Before the group formed, the last time anyone had performed the dance was in the 1930s. In 2003 Marie Junaluska, a Tribal Council member of the Eastern Band of Cherokee Indians, wanted to find a dance traditionally used to welcome visitors from other nations. She and I worked together to find Timberlake’s description of the dance that welcomed him as an emissary of peace from the British government to the Cherokee Nation in 1762. I discovered recordings of the song made in the 1920s on wax cylinders, kept at the Library of Congress. Junaluska picked Cherokee men to bring this dance back to life: elder Walker Calhoun as the singer, John Grant Jr., Daniel “Sonny” Ledford, John “Bullet” Standingdeer, James “Bo” Taylor, Daniel Tramper, Hoss Tramper, and Will Tuska. Because they all grew up performing traditional Cherokee dances with their families or people in the community, these men understood how the dance would work. Later, other dancers joined the group. 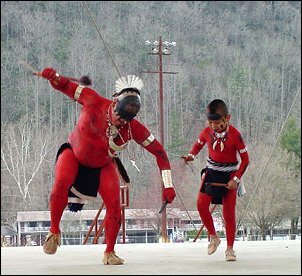 The Warriors of AniKituhwa first danced for the Intertribal Timber Council in 2003, welcoming other American Indian nations to Cherokee. In December 2004 the men danced at Colonial Williamsburg, Virginia, on the Palace Green, where the last Cherokee delegation had danced in 1777. When they returned home, the Tribal Council of the Eastern Band of Cherokee Indians made the dancers official cultural ambassadors representing the tribe, with the Museum of the Cherokee Indian as their sponsor. Since then, they have become a symbol of Cherokee tradition and pride. Dance is very important to the Cherokee and to other American Indian people. One Cherokee legend says that if Cherokee people ever stop dancing, the whole world will come to an end. Dance has an important place in Cherokee culture. For hundreds, even thousands, of years, Cherokee people danced. Most of the songs were sung by men, who played hand drums made of cedar or pine, full of water with skin stretched on top. Women provided rhythmical accompaniment using turtle shells filled with pebbles strapped to their lower legs. These different roles show how the Cherokee looked at life: people could be different and still be respected. A song needed both men and women. The oldest turtle shell rattles found in the Southeast are more than four thousand years old. Today, the Warriors of AniKituhwa have revived other dances that have not been performed for several generations, such as the Buffalo Dance, Ant Dance, and KneeDeep Dance. The group performs other traditional dances that are more well known, such as the Bear Dance, Beaver Hunting Dance, Horse Dance, and Friendship Dance. At Williamsburg, the men have done historic reenactments of the Cherokee delegations that visited the colonial capital. They have danced in the rotunda at the National Museum of the American Indian in Washington, D.C., and at the National Powwow in that city. In Canada, Germany, Washington State, and in the Seminole Nation, they have shared Cherokee dances, history, and culture. But their favorite place to dance is in Cherokee, for Cherokee children and elders. Cherokee continue to preserve the land and the culture. The Warriors of AniKituhwa pass on their dances to the next generation, so that the dances—and perhaps the Cherokee world—will survive. Warriors of AniKituhwa. Cherokee, Music and Dance, Cherokee, NC (Qualla Boundary), Blue Ridge Heritage: http://www.blueridgeheritage.com/traditional-artist-directory/warriors-of-anikituhwa. Warriors of the AniKituhwa. Image available from The Museum of the Cherokee Indian.